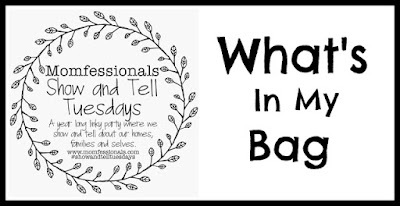 The Mrs. Fisher: Show and Tell...What's in My Bag? Show and Tell...What's in My Bag? I'm linking up today with another set of blogs for Show and Tell Tuesday. This week's topic? What's In My Bag? Isn't the color gorgeous? It's the perfect cognac color and has just the right amount of pockets. Now, this bag comes with me everywhere - work, errands, travel, etc. So I like a roomier bag with space to toss a lot of stuff. If I were just running around on the weekend, I'd toss the "Miscellaneous Purse Stuff" pouch, sunglasses, and wallet in a crossbody and call it a day. #iloveagoodcrossbodybag. Glasses - I had LASIK about 5 years ago and I would do it again in a heartbeat. My distance vision has declined a bit in the last year so my optometrist is monitoring and in the meantime she gave me a prescription so I can see when I'm driving at night. Miscellaneous Purse Stuff - I love this pretty little yellow pouch. I believe I got it from Jane. I keep hand sanitizer, band aids, eye drops, pens, gum, etc. in here and then it's not all floating around in my purse. It also makes it super easy to swap bags. Sunglasses - I've had these sunglasses for 6 years and I love them. They're oversized Burberry sunnies and I feel like a movie star when I wear them. Similar here. iPad - my iPad mini was a birthday gift from Phillip last year and I have it on me most of the time. I have both the nook and kindle apps on there and I constantly have multiple books going at once. I'm currently reading Dead Wake by Erik Larson and I am hooked. Um, have I mentioned I love makeup? #ihaveaproblem I've got about 6 lipglosses in here in varying shades of the same color - a brownish berry color. My current faves are the Buxom in the shade Sugar and the Sephora in Earth & Fire. That's what's in my bag! Tomorrow - another edition of Stranded, see you then!